C4R receives DCR Trails Grant! 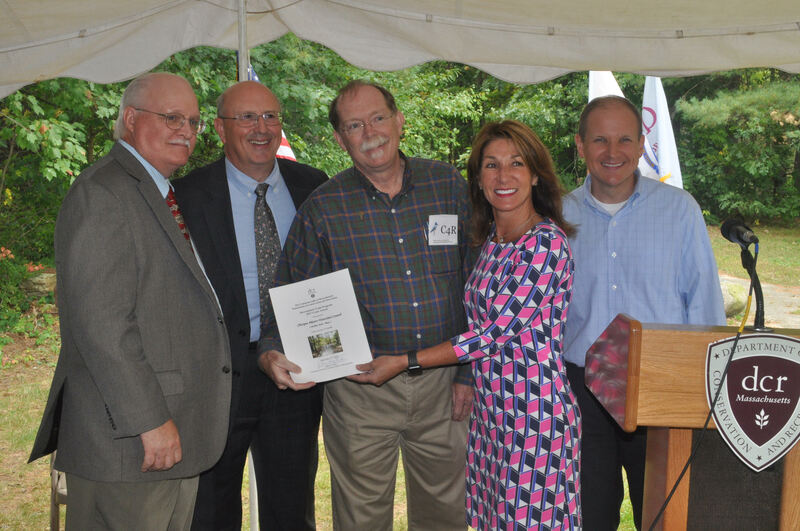 C4R coordinator, Keith Davies-center, accepts a trails grant award from state officials. Great News: DCR has awarded C4R a grant to advance and complete work on our first 2 Blue Trails and begin scoping out our next 2! The grant will help C4R complete both the upper Quaboag Blue Trail through the Brookfields into Warren and the Chicopee River Blue Trail in Wilbraham/Ludlow/Springfield by summer of 2018. Work includes location signage, kiosks, and completing the map guides. These are great places for paddlers to explore! C4R will also begin layout work for blue trails on the Ware and Swift Rivers. C4R will also be offering a presentation at the Mass Trails Conference on November 4 about Blue Trails. Locally, C4R will hold its 4th annual SUMMIT on November 12th in Palmer to share our recent accomplishments and our vision for going into 2018 and beyond, save the date, come join us.